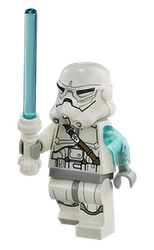 Jek-14 is a minifigure first released in 2013. He is an original character from The Yoda Chronicles. Jek-14 has black, slicked down hair. He has a double sided face with the front having a serious expression with light blue eyes. The other side has a power-crazed expression with white eyes, bordered by light blue, with blue lightning emanating from them all over his face. The front of his torso is primarily white with a white and red breastplate. 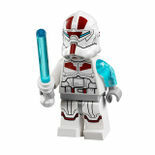 He uses a blue Lightsaber with a white hilt. Below his breastplate is a small, rectangle. At the bottom is a red and white utility belt, and red and white leg armor. He has a transparent blue left arm which is his lightning arm and a white right arm. His hands and hips are medium stone grey. In The Yoda Chronicles, Count Dooku and General Grievous stole the lightsabers belonging to Yoda's Padawans, so they could use the crystals inside of them to create an army of force sensitive Clone Troopers. Yoda, Mace Windu and R2-D2 arrived, to stop them. When they had defeated Dooku, he used the force to push the crystal towards one Clone Trooper, who awoke. They were unable to fight him, because the crystals had powerfully enhanced his powers. He choked Yoda with the force and prepared to kill him, but Yoda and Mace Windu were saved by the Padawans. Jek-14, the Sith Clone was later introduced to Palpatine after him and Count Dooku escaped. He chose not to fight for the Sith in the second episode, and decided he just wanted to create things with the force. Jek-14 escaped Geonosis, after Yoda and Dooku chased after him, attempting to get him on each of their sides. Dooku and Grievous captured him, and cloned him to finally make their army of Sith Clones. While this was occurring, Anakin Skywalker blew up the Malevolence, causing the army to come crashing towards Corusant. Darth Sidious was there, and saved them with the force, while no one was looking, to protect his identity. Grievous carelessly threw Jek-14 out of the Malevolence, knowing the Sith had no more reason to use him. The Sith Clones began attacking the Jedi Temple, but they were saved by Jek-14, who destroyed his clones, and sent Count Dooku and General Grievous flying into space. Jek-14 then told the Jedi to leave him alone, and flew away in a Headhunter. Jek-14 is the first minifigure to include a transparent limb. He is also the first to have a white lightsaber hilt. In the trailer he is seen transforming his transparent arm into a red blade. His dangerously enhanced Force powers were given to him when Count Dooku channeled Force energy from an extremely powerful Kiaburr lightsaber crystal into his cloning chamber. Dooku had originally planned to make an enormous army of less powerful, yet still Force-sensitive Sith clones using the crystal's energy. When Yoda and Mace Windu tried to stop him, he used the Force to give extreme powers to Sith Clone #14, AKA "Jek". He has an extreme desire to create, a possible homage to LEGO. This page was last edited on 6 March 2016, at 06:54.